1821/22 Pattern British light cavalry officer's sabre, named to a very important officer in the 16th Lancers. 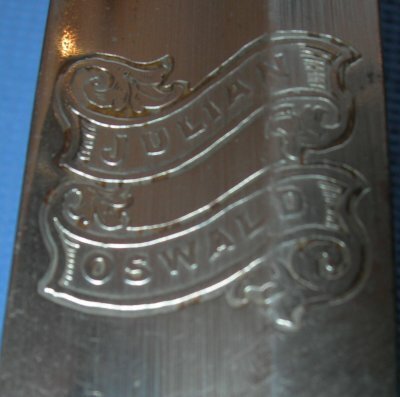 This is the sabre 2nd Lieutenant Julian Oswald (born 17th February 1860) bought from Wilkinsons in 1879 (serial number 23402) when he joined the famous 16th Lancers after having served in the local militia. Julian Oswald made Lieutenant in 1880, Capatain in 1886 and Major in 1894. In 1900 Major Oswald was for a brief period in command of both squadrans sent from India to serve in the Boer War; the 16th Lancers made one of the most famous cavalry charges of that war and, in fact, one of the last truly great cavalry charges in history. Although it is unlikely he carried this sabre in the Boer War as senior officers carried mamalukes generally, it is still possible as the 1821P was recognized as a superior field weapon. 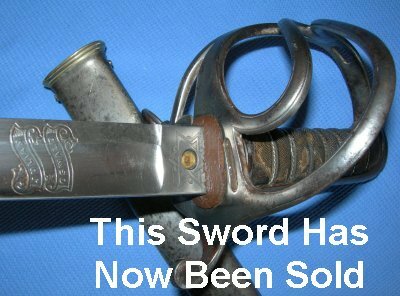 In any event, this sword belonged to a very distinguished British cavalry officer at the outset of his career, when he earned a name for himself and with that rose the army ranks.